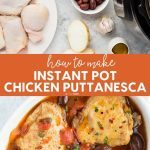 Easy Pressure cooker Chicken Puttanesca Recipe is a breeze to make in your Instant Pot or other electric pressure cooker. It’s a gluten free variation of the Italian dish Spaghetti alla puttanesca. 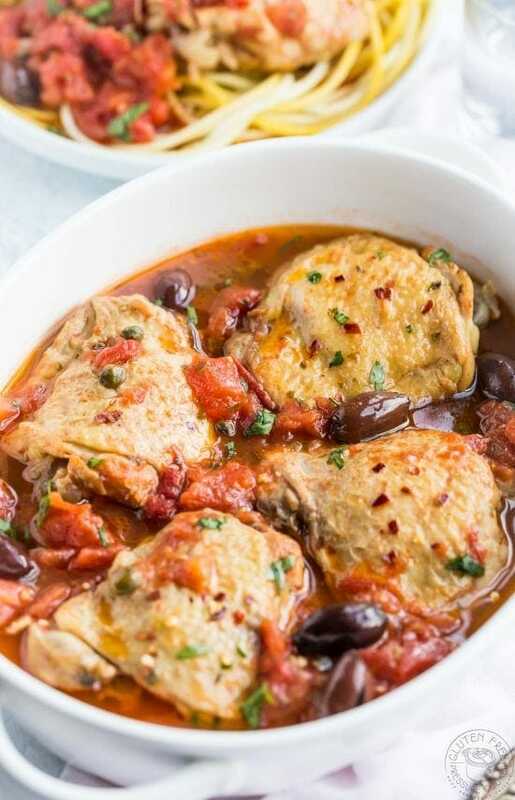 My Instant Pot Chicken Puttanesca is made with chicken, tomatoes, olives, and herbs. 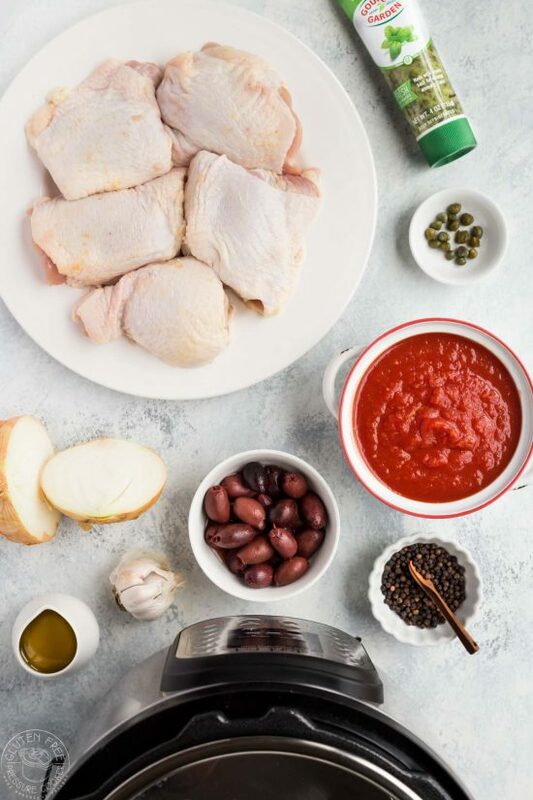 Puttanesca sauce hails from Naples, Italy and is typically made with tomatoes, black olives, capers, anchovies, onions, garlic, and often fresh herbs including oregano and parsley. Like any great recipe there are some regional variations, sometimes the anchovies are left out (I don’t have them in this recipe) and chili peppers are sometimes included. I have of course added chicken to it to make a really hearty, easy weeknight dinner. The sauce usually served over spaghetti or another pasta variety. I thought it would be great served over zucchini noodles instead of pasta, but you can choose whatever suits you best if you’re not following the paleo or Whole30 diet. This is a recipe that is easy enough to make on a weeknight for your family, but fancy enough to serve at a dinner party so that’s a win win in my book! I like to saute the chicken thighs skin side down to crisp and brown them up a little before I cook them, even though they lose most of the crispiness when they are added to my Instant Pot they still retain a bit of the color. The chicken is cooked easily in the pressure cooker for only 15 minutes at high pressure. It’s important you let the pressure drop naturally as directed, so that you don’t end up with a tough piece of chicken! You’ll need a pressure cooker to make this recipe, while it will work in any version the timings are for an electric pressure cooker. If you don’t have one already I highly recommend choosing one of the Instant Pot brand of pressure cookers, I have two of them! I have a helpful post that lists my top ten Instant Pot accessories so make sure you take a look at that too. 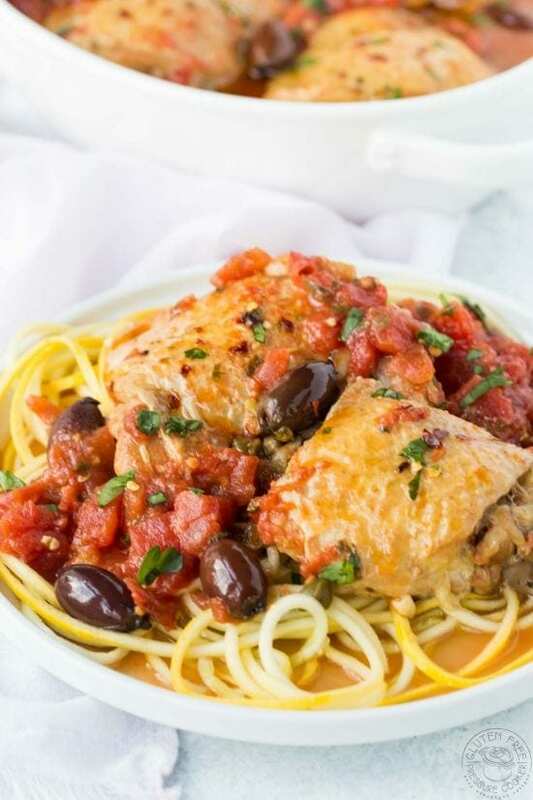 This easy Pressure cooker Chicken Puttanesca Recipe is a breeze to make in your Instant Pot or other electric pressure cooker, it's a gluten free variation of the Italian dish Spaghetti alla puttanesca. Turn on the 'saute' function in your Instant Pot or other electric pressure cooker and add the oil. Wait 1 minute (don't wait until the display says hot) and add the chicken pieces skin side down, a couple of pieces at a time until they are browned and no longer stick to the bottom of the pot, about 5 minutes or so. Remove all browned chicken to a plate. With the saute function still on, add the chopped tomatoes, water, olives, garlic, capers, chopped basil, red chili flakes, and some salt and pepper. Stir everything well, bring it up to a gentle simmer, then replace the chicken thighs in the pot. Lock the lid, turn the vent to 'sealing' and using the manual setting, adjust it to cook for 15 minutes at High Pressure. Serve with a side of vegetables, I used zucchini noodles. You could also serve with gluten free pasta if you are not following the paleo or whole30 diet. So is it thighs or breasts? Ingredients show thighs and then step 2 says breasts. Is it just preference? Hi Jackie! you’re right, that was my mistake, it should say thighs, I’ve corrected it. You could try breast meat but the cook time might be different, I’ve only made it with thighs as I think they are nicer in the pressure cooker. 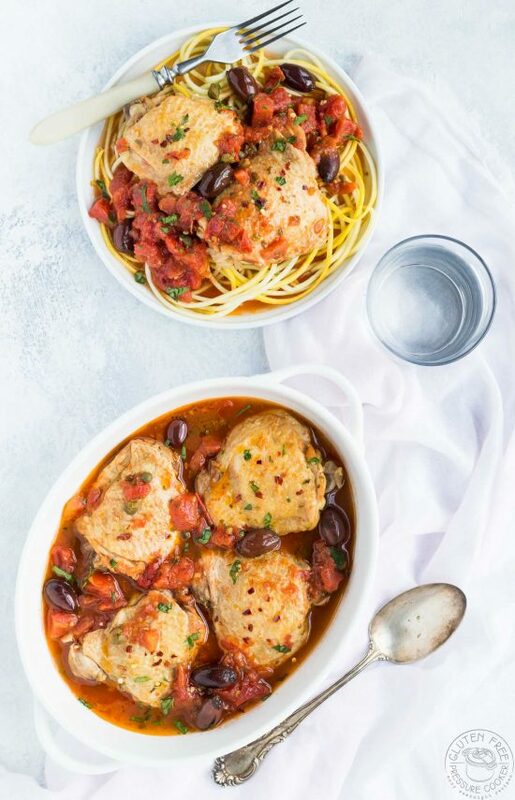 I love Chicken Puttanesca so I can’t wait to give this recipe a go, thanks!! Hi Deb, I hope you love it! I just got an Instant Pot and am browsing recipes. I find very few of them have correct timing in that so many (including this one) call for “natural release” which, from what I can tell, adds about 15 mins. When you put that in the timing for the recipe, the total time on this recipe is closer to 40 mins. This makes a difference when timing dinner & sides. It may require at least another glass of wine for prep time, too… so it’s not all bad! I went back and forth about this when I started this site and there’s not an easy way to input the timing like that, if I had a recipe widget especially designed for the pressure cooker it would include the approximate time to pressure, the cook time, and the approximate time for pressure release, but as it is it only has one slot for timing. So for the moment, I prefer to just have the cook time at pressure listed as most folks know to add on 5-10 min at the start and another 5-10 at the end. what a wonderful recipe, thank you and thank you also for the additional recipes like the Korean ribs, really nice and love how easy that is, thank you for all! Hi Sabrina, do glad you like it! So good! Definitely will be making this again. We really enjoyed this, thank you!! We had plenty of saucey goodness leftover and we couldn’t bear to toss it… do you see any reason why we couldn’t use it to make another batch? We weren’t sure if the tomatoes would overcook. Or should we just cook chicken separately and combine it? 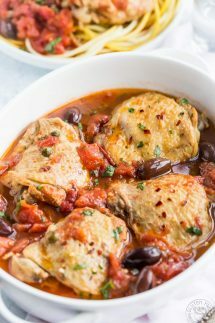 Do you think you can make extra thighs with the recipe since it seems like there will be extra sauce? Have you tried doubling the recipe to make a larger portion at one time? Your recipe looks really yummy and I can’t wait to try it. Hi Michele, I’m pretty sure if the size your pressure cooker can accommodate the extra chicken thighs then you can simply add more! That sounds like a delicious addition! I would try adding the anchovies along with the tomatoes and see how that works.